Bernie Ecclestone to bid for Saab | What Car? Formula One boss Bernie Ecclestone will make a bid for Saab, the Swedish car maker being offloaded by General Motors. Ecclestone confirmed his plans last night, as potential bidders finalised their offers before GM's board meets today to decide Saab's future. 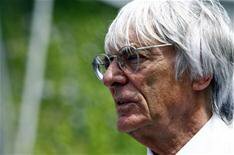 Ecclestone's bid is made in partnership with Genii Capital, a private investment firm. The group also said that it believed Saab had 'tremendous brand value' as well as an innovative image, and hoped that it would pioneer developments in energy efficiency and in-car communications platforms. Genii Capital last month agreed to buy a majority stake in Renault's Formula One team.